META MISSION – Developing Vision. Progress, Purpose and path. Dwell in the land of possibilities and explore the great sky of potential. LEARN to LEAD IN in with greater perspective – Like an eagle soaring, sometimes we need help to see the whole landscape of our lives. What is our Purpose, our Path? What is our unique legacy and how will we contribute? Without perspective there can be no progress, and without progress there is no achievement and no satisfaction. Where will you progress to, and how will you move from where you are to where you want to be? META MEANING – Deep core values give meaning to our lives – without clarifying what is most meaningful, how can we experience it? In order to gain momentum, maintain motivation and keep commitments while feeling engaged and inspired – meaning is the get up and go we need to follow through and achieve what matters most. 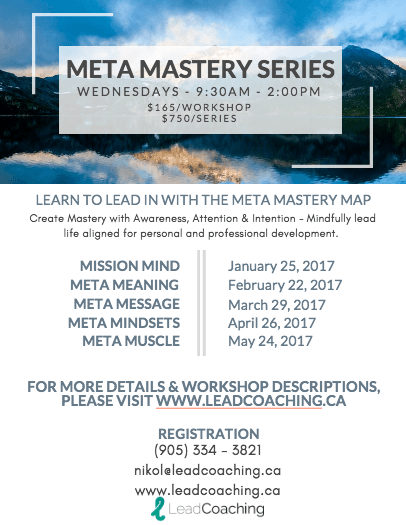 META MESSAGE – creating and declaring creed and code – this workshop is all about who you are, who you decide to become and how to be all that you dream you could be. This is a powerful and productive day that builds accountability to our highest vision of ourselves, stopping limiting beliefs, negative inner dialogue and unproductive patterns with clear creed and code. Learning to make value based priorities and LEAD in with our personal platform of power, we can be and become our best selves, make choices and decisions, create and achieve with ease. META MINDSETS – We have all heard about “what we think we create” Neuroscience gives us evidence, procedure and strategies to create meaning and achieve more of what matters most. Create the mental mindsets and habit systems to support self-mastery and success. Platform your success through the easy installation of more productive neurology, program your thoughts, habits and beliefs for more fluidity and flow, develop productivity, perseverance and resilience to life stresses and anxiety and feel the full enrichment of life experiences. MUSCLE MIND – This is a How to Best Practices Workshop to actually change physical habits – Learn strategies in creating a platform to achieve goals such as nutritionally eating, fitness & exercise and destroying negative habits that hold us back. This is a highly interactive, best practices conversation, evaluation and measurement of what works well and even better if.